Our ability to step out of ourselves and observe ourselves from the wall or ceiling is core to our ability to be human. That ability to see ourselves from another point of view gives us instant perspective and the ability to separate stimulus from response. The question, then, is how often do we step out of the frame in the course of a day or week? How often do we trigger reflection and perspective? For most of us, sleep, meditation, a walk in the outdoors, writing in a journal, taking deep breaths, running, among others, are ways to do so. Doing most or all of these well over the course of a day aren’t an optional add on at the end of a work day. They result in step changes in productivity as perspective inspires a focus on what actually matters. And, perhaps more important for our life and relationships, they enable us to be more in touch with our humanity. An audit is an inspection of an organization’s processes typically conducted by a third party. I love the idea of an annual audit and I think I’ve become more conscious about the process over time. And, this year, I am thinking about the various parts of my life as I aim to commit to a few practices for the coming year. 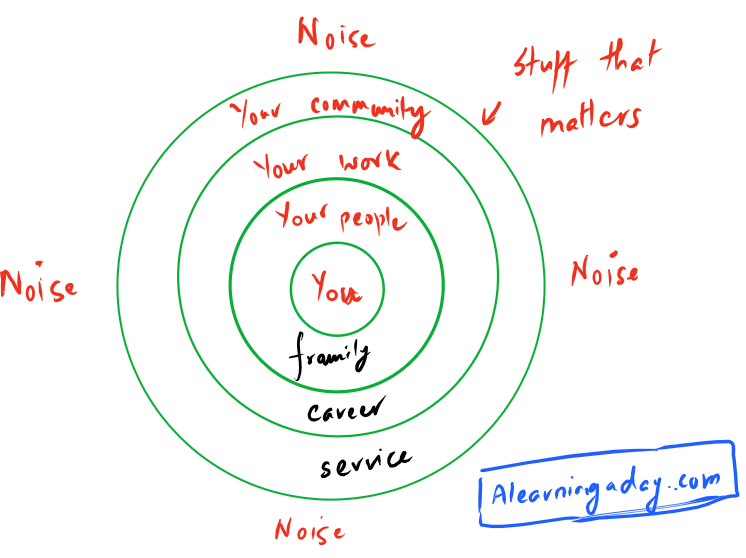 For starters, I tend to take a concentric circle view when I think of my priorities. This builds on a simple principle – you can’t take care of others until you take care of yourself. However, the prioritization that follows is personal. I think of my people, my work and my community (service) as the priorities that follow – in that order. So, here are some questions I’m asking myself. This isn’t an exhaustive list of the question I should be asking as I’m focused on areas I most want to improve. How can I be fitter? 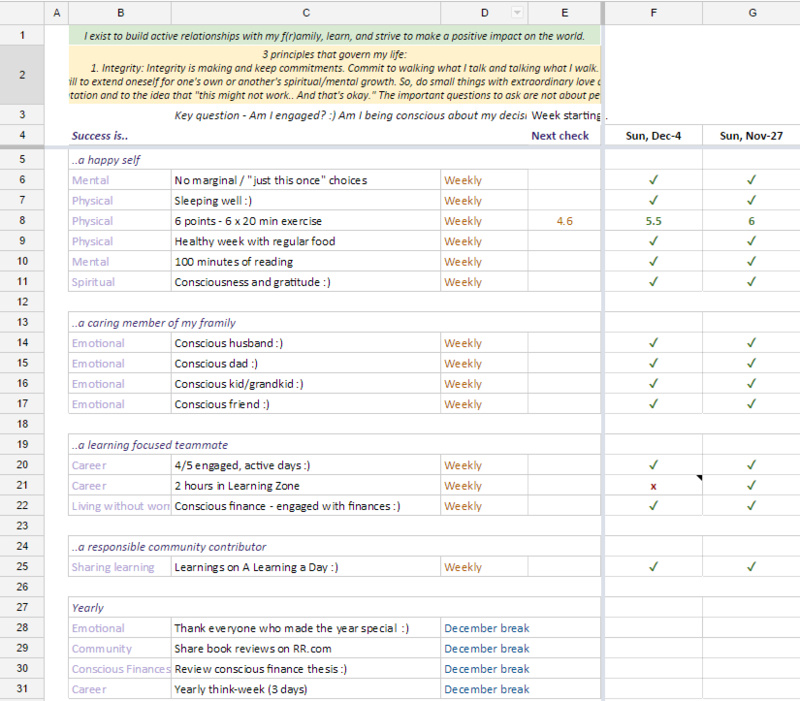 What is my information diet looking like? How can it be less, but better? How can I be more conscious in my relationships? How can I organize my workday better to make sure I’m tapping maximum productivity? Post kid, how do I embrace more flexibility in terms of when I work without letting it affect my engagement at home? How can I take the time to synthesize what is going in tech? How can we manage our finances better? How do I define service? I’ll aim to write about the results of these questions over the next few days. 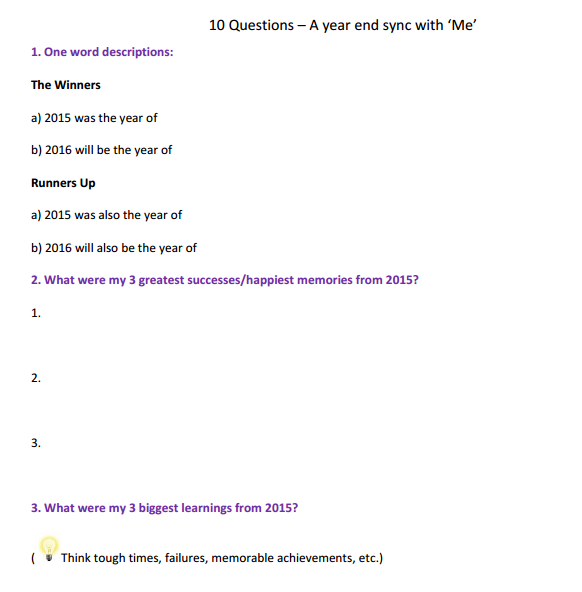 6 years ago, I created a 10 question annual review form as a way to do a “look back and look forward” reflection exercise at the end of the year. Of course, ten questions isn’t perfect and longer forms might do a better job. But, I wanted the reflection to be short and fun rather than something that felt daunting. Over these years, I’ve found myself spending lesser time on this review. That’s because the questions from the exercise, particularly the ones around the skills I intend to develop, have increasingly driven my thought process during the year. So, the reflection has become an ongoing process rather than a once a year thing. And, I think that’s exactly how it should work.